Fill 4-quart Dutch oven one-third full with canola oil. Heat oil over medium heat to about 350°F. In medium microwavable bowl, stir together sugar, cinnamon and nutmeg. Add chopped apples; toss until coated. Microwave on High in 20-second increments, stirring occasionally, until apples are tender. If apples are a little too tart, stir in a sprinkle of additional sugar. Separate dough into 8 biscuits; cut each into quarters. 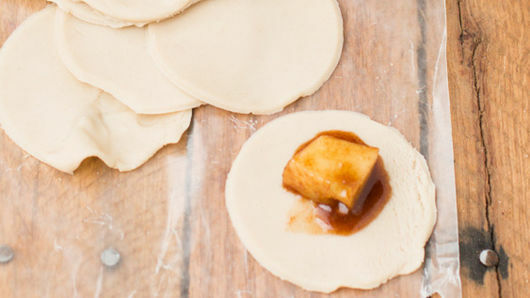 Place 1 apple chunk and a little juice on each piece of dough; pinch edges to seal. When oil is hot, carefully drop several stuffed biscuits into oil at a time. (See Tip.) Using slotted metal spoon or kitchen spider, carefully turn stuffed biscuits over and over until golden brown. Remove from oil to paper towels to drain. 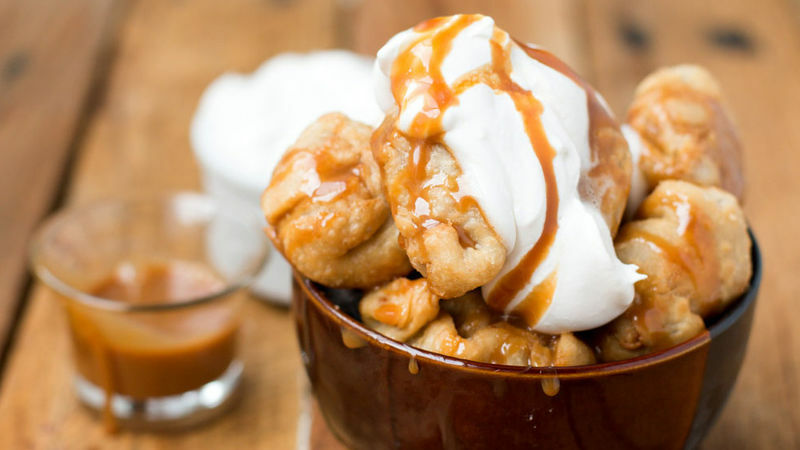 Immediately place in serving bowls; drizzle with caramel sauce and top with whipped cream. Serve. The safest way to fry is to bring your hand close to the oil and gently drop in the stuffed biscuits versus quickly dropping and splashing the oil.